In my next book And Cowboy Makes Three, I’ve tossed that trope on its head. Angelica May is the town bad girl who leaves stand-up-guy Rowdy Masterson on the eve of their wedding with no explanation whatsoever. When she returns to town years later with a Down syndrome newborn baby Toby and no wedding ring, no one is surprised. She’s only in town to sell off her late grandmother’s land to Rowdy, but things get complicated fast. Bad boy, bad girl, or totally the opposite. The truth is, we all need redemption in our lives. And really, that’s what Christian romance novels are all about. She looked around and sighed in exasperation. This wasn’t a picnic. Or rather, this wasn’t just a picnic, though there were brightly colored baskets covered in ribbons dotting the lawn all across the community green. And this wasn’t a quiet, personal outing with Granny’s best friend, Jo Spencer, as Angelica had been given to expect, either. Not that an outing with the boisterous old redhead who owned Cup O’ Jo’s Café could ever be labeled as quiet. That woman wouldn’t know quiet if it bit her on the nose. In hindsight, Angelica realized she should have gone with her gut feeling and headed straight to Granny’s ranch instead of stopping in at Cup O’ Jo’s to let Jo know she’d arrived safely. A phone call would have sufficed. But no. Jo had been adamant she come straight to the café, sounding a bit too enthusiastic about seeing her again. Everything about Jo Spencer was enthusiastic, but her suggestion had been over-animated even for Jo. She’d even anticipated Angelica’s hesitation, telling her to slip through the back door of the café. She’d assured her that she wouldn’t be seen by any customers, and that her nephew, Chance, the cook who would no doubt be in the kitchen, would keep their secret. He wasn’t much of talker, anyway. If only she hadn’t been in such a hurry to get into town and out again without being seen that she hadn’t recognized the signals, the internal alarms blaring in her head. Their meeting was only supposed to be her and Jo. Having been Granny’s best friend, Jo understood Angelica’s dilemma at returning to Serendipity at all—or at least Angelica had thought she had. Jo had exclaimed over the newborn and then had handed her a letter written by her recently deceased granny, addressed with only Angelica’s first name and scribbled in Granny’s chicken-scratch handwriting. “Consider it a last request,” Jo had suggested. More like a cryptic note. It was a strange thing to ask, but Angelica figured it was the least she could do since she hadn’t been able to be there for Granny’s last days—or even her funeral. If she hadn’t followed the instructions out of love for Granny, she would have followed them out of guilt. Which was why she had found herself smack-dab in the middle of a full-fledged town event, Toby tucked into a front pack. Serendipity did their parties up right, and, as usual, nearly everyone in town was present enjoying every moment of the event. Here in Serendipity, a person could expect to find a lot of love and laughter. But even as a youth, Angelica had struggled to capture the happy spirit of the town celebrations. And no wonder. For as long as she could remember, she’d been the town pariah, as well as her family’s. And after the catastrophic series of events that sent her fleeing Serendipity on the eve of her own wedding rehearsal, well, she didn’t expect anyone to forgive her—least of all her ex-fiancé, sheep farmer Rowdy Masterson. Standing right in the middle of a large crowd of people, most of whom had known her back in the day and had no doubt not forgotten her or her mistakes, was exactly the type of situation Angelica had most wished to avoid. Thankfully, the event in progress was an auction, with Jo as auctioneer. Something about making money for a new senior center. Everyone was busy watching the platform, where one of the young bachelors on the docket was flexing his biceps for a very appreciative crowd. Just as long as it kept her out of the limelight, she was good. She’d come back home to Serendipity on the sly, for one weekend only, with a deliberate and strategic agenda. Since she would be staying at Granny’s now abandoned sheep farm, she hadn’t expected to see anyone other than Jo Spencer, who had been named the executor of Granny’s estate, and Granny’s lawyer, Matthew MacPherson, who would guide her in whatever next steps she needed to take to fulfill the terms of Granny’s will—and to sell the ranch. She’d most definitely had no intention of interacting with all the people who’d known her back then. People who would stand as judge and jury on the way she’d lived her life—especially since she’d arrived back in town with a baby in tow and no ring on her finger. She didn’t understand what was going on right now. She and Granny had planned to get together this precise weekend, even before Granny’s health had taken such a downhill spiral. She had the sinking feeling Granny had something planned for this auction, something that Jo was now tasked with making sure Angelica followed through on. Angelica might not be able to avoid the crowd today, but she prayed with her whole heart that she’d at least be able to steer clear of Rowdy. She didn’t want to be responsible for suddenly triggering thoughts in Rowdy of a painful past he would no doubt rather forget. She didn’t want to hurt him. Not for the world. Because long ago, in her youth, she had been in love with him, believing they were soulmates who would grow old together, live happily-ever-after. Anyway, he’d probably moved on with his life. Perhaps he had even married and started a family. She’d been too ashamed to ask Jo how Rowdy was doing. She was grateful that so far, she hadn’t laid eyes on him and she hoped to keep it that way. Her stomach churned like a combine across her nerves and it was all she could do not to be sick. Not for the first time that day, she wondered if she ought not leave before someone recognized her. Her soft pink hoodie was made of a light cotton material, but she felt uncomfortably warm and stifled as she stood near the back of the crowd on the small-town community green, attempting to remain incognito while surreptitiously watching to make sure Rowdy was nowhere in the vicinity. Up to this point, no one had appeared to take much notice of her, as everyone’s attention was still completely absorbed in what was taking place upon the wooden platform currently serving as an improvised auction site. Serendipity, Texas’ First Annual Bachelors and Baskets Auction was already well under way, with many bachelors—and several married men, as well—already lassoed off the stage and into the care of their winning bidders, ladies beaming and cheering in delight over their triumphant purchases. What had started as a regular bachelor auction had quickly expanded to include married men offering their skills at fixing dilapidated houses or old cars. The ladies could bid on whatever man had the skills to match their projects. Several of the cuter bachelors had been purchased not so much for their practical skills as their good looks and the possibility of a date. The single ladies weren’t about to pass up such a grand opportunity. Not to be outdone by the men, the local women had offered to share decorated picnic baskets brimming with good, homemade country cooking with the fellows they won. She wished Granny was still around to explain to her what all this was about. Why had Granny wanted her here? But then, if Granny was still around, Angelica wouldn’t be conspicuously standing in the middle of the community green, feeling as if she had a fluorescent sign flashing over her head announcing her return. Out of nowhere, guilt assaulted Angelica, burning her insides. Through no fault of her own, she’d had to miss the end of Granny’s life, and even her funeral. But that didn’t stop her from feeling bad about it. If only Granny had lived long enough to see this weekend with Angelica. How different life would be then. She held on to her new faith by the tips of her fingers, but there was so much she still didn’t understand. God’s ways were different than man’s, but how could He have let this happen, just when she’d discovered the joy of knowing Christ? Granny was still supposed to be alive. When she’d suddenly fallen gravely ill, Angelica had wanted to rush to her side, but there had been complications with the pregnancy and she couldn’t travel. Granny had insisted everything would be okay. But it hadn’t been okay. Granny had passed far too soon. Oh, how she would have loved her namesake, precious Toby Francis Carmichael. Angelica’s heart broke every time she thought about it. They’d intended this weekend to be a special get-together so Granny could meet Toby, but she’d passed away the very day Toby was born. Since Angelica’s travel plans had already been made, she hadn’t seen any reason to change or cancel them. She had come home to pay her respects and meet with the lawyer, not attend a party. Get in and get out. And the less people who knew about it—about her—the better. The whole atmosphere was charged with joy and excitement, but Angelica, with a baseball cap pulled low over her brow and her hoodie over that, wasn’t feeling either one of those emotions. It had been eight long, painful years since the last time she’d attended a Serendipity function. Her heart clenched and her emotions took a nosedive. She’d never been anything more to this town than the token troublemaker, no matter how hard she’d tried to change people’s opinions of her. Despite Angelica’s faults—and what she now realized was a defensively bad attitude—Granny had understood her. And Rowdy had loved her. Had being the operative word. Her thoughts abruptly were called back to the present when Toby, tucked reassuringly close to her shoulder, sighed in his sleep and sucked on his fist, momentarily shifting Angelica’s attention away from the platform. Toby was such a sweet, beautiful baby, a real blessing in every possible regard. Granted, as his mother, Angelica knew she was a little bit biased. Since Jo was serving as the auctioneer, she had ditched Angelica with not so much as a second glance, much less an explanation. It shouldn’t bother her to be left alone. She’d been on her own most of her adult life. But it hurt her nonetheless. Maybe because she felt she was underneath an unseen spotlight. Or maybe because Jo was a friend. Angelica had been left to the mercy of the throng as it grew tighter toward the platform, pushing her with them. Her anxiety level rose exponentially as she became farther engulfed by the crowd. So much for a calm, peaceful picnic. Angelica pulled Toby a little closer, murmuring soft nonsense words in his ear and tucking her head close to his, inhaling his sweet, soothing baby scent. 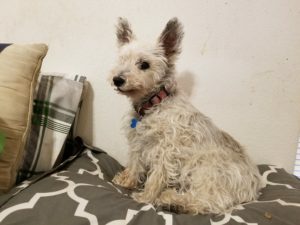 She reassured herself with the thought that very soon, this would all be over and she could hightail it out of town and back to Denver where she belonged. Or not belonged, really. She didn’t fit in anywhere. But at least she wasn’t under the constant judgment she felt sure she would find here in Serendipity. “All right, folks,” Jo announced with a boisterous bounce in her step that sent her red curls bobbing. When the crowd didn’t immediately quiet, she pounded her gavel on the podium several times until she was certain she had everyone’s attention. Angelica’s breath froze in her lungs as she slowly raised her head. At the first sight of him, her heart jolted to life and then dropped like a boulder to the pit of her stomach, where it rumbled around disturbingly. The crowd roared as Rowdy stepped up onto the makeshift wooden platform, his mouth creased in a friendly grin. Much had changed over the years, but not Rowdy’s smile. A shiver of awareness vibrated through Angelica at her first glimpse of the man she knew so well, and paradoxically, didn’t know at all. Angelica cringed as he stepped forward, still slightly favoring his left leg when he walked. So his injury had never completely healed, then. The inside of her head reverberated, her guilt clanging like a gong, and a wave of nausea washed through her. That was all on her. It was enough to shatter her heart all over again. Yet another prayer left unanswered. She had so wanted Rowdy to be healed completely of his injuries. 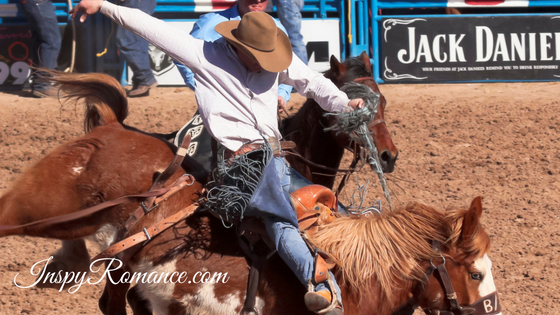 If it hadn’t been for her pressing him to participate in the saddle bronc event he hadn’t been prepared for, he wouldn’t be limping in the first place. Other than the way he clearly put additional effort into moving his left leg over his right, time had been good to him. He was as handsome as ever, with thick wavy blond hair and warm blue eyes. Strong planes defined his masculine face, weathered from the sun and shaded with a couple of days’ growth of beard giving him a rugged air. He’d filled out in the years since she’d last seen him. His shoulders were broader and his muscles more defined from ranch work. Not surprisingly, Rowdy didn’t have to entertain the crowd by doing tricks or flexing his muscles to get their attention, as other men before him had done. He merely flashed them his signature toothy grin and gestured with his fingers for his rapt audience to increase their applause. The resulting hoots, catcalls and laughter made Rowdy’s grin widen epically and he tipped his hat in appreciation. She remembered Rowdy’s smile all too well, along with the whispered words of a happy future meant just for the two of them alone to share. An ugly, dark feeling churned in her gut and she swallowed hard against the bile that burned in her throat. She counted those days as nothing more than the naïveté of youth, when they still thought they had their whole lives before them and that they could weather any storm life threw at them as long as they were together. When they’d believed they were invincible. They hadn’t yet comprehended that life could change in a moment. But they’d learned. Oh, how painfully they’d learned. It had only taken one second for their whole world to come crashing down around them. And some things a person never recovered from—physically, emotionally or spiritually. A group of laughing young women near the front of the crowd immediately started bidding on Rowdy, cheerfully one-upping each other before Jo could officially open the bidding. “Wait, wait. No bids, please,” Jo said, holding her hands up to stop the ladies from continuing. The noise of the crowd immediately dropped to a hushed whisper. The crowd rumbled in agreement. Angelica continued to keep her head low but her ears were perfectly attuned to Jo’s words. She had a lot of questions that she was certain were echoing through the crowd. Who had enough wherewithal to convince Jo to bend the rules of the auction? Maybe a better question would be—how? Jo tended to rule with an iron fist when she was in charge of an event—which she usually was. Between the two of them, Jo and her husband, Frank, the head of the town council, kept Serendipity running smoothly. The old redhead was a stubborn as the day was long, and most people in town wouldn’t even conceive of trying to change her mind once she’d gone and decided what was what. There was no arguing with her. And she was a stickler for rules—at least when it suited her. Apparently today it suited her to make up her own new set of rules. Jo snorted and shook her head, laughing at the negative reaction of the townspeople. She didn’t even try to explain herself. Not good old Jo Spencer. Instead, she gestured for Rowdy to remove his hat, hitched up the rope in her palm—the one waiting for the winning bidder to lasso their catch with—and expertly flicked the noose around Rowdy, tugging the line tight around his shoulders. Angelica was impressed with Jo’s roping skills. The old woman ran a café, not a ranch. Clearly, she’d been practicing, and apparently, Angelica guessed, whatever was happening here with Rowdy was the reason. She’d known beforehand that she would have to trick rope this particular pony. Without so much as looking back to see if he was following, she snapped the line taut and led him off the platform, the crowd parting before her. He was being ushered off to who knows where like a lamb to the slaughter, Angelica thought. Rowdy didn’t resist. Why would he? He had to be at least as curious as the murmuring crowd as to the identity of the woman who’d purchased him. Someone had cared an awful lot to go to the trouble, not to mention expense, of buying Rowdy in such an unconventional fashion. Angelica didn’t even want to know. And she absolutely ignored the sting of envy that whipped through her. Rowdy was in her past, something she would rather not revisit right now. She had enough on her plate just caring for Toby—and now trying to figure out how best to put the Carmichael property to market and still honor Granny’s last wishes. She appreciated the money she’d been left along with the land, and she knew Granny had been thinking of Toby when she’d written that part of her will. But Toby was special and would never run a sheep farm—and Angelica certainly couldn’t. She was the furthest thing from a rancher as it was possible for her to be. She was a pastor’s kid—and not a very good one—who had grown up to be simple hotel banquet server. Not the best job ever, but it paid the bills. And as a single mother, she couldn’t afford to be picky. The obvious solution was to sell the ranch that had been in the family for generations, and then pocket the money to use on Toby’s future—a future that didn’t include working with sheep. Gramps had died young of a heart attack and Granny’s only son, Angelica’s father, Richard, had chosen the pastorate over sheep farming leaving Granny Frances to work the land well past the time she ought to have retired. Angelica would have been able to save the day merely by marrying Rowdy as she’d once intended to do. They’d planned to join their land together, since his family were sheepherders, as well. Instead, she’d run away and in the process dashed the hopes and dreams of more than one person. That for even one moment she’d considered being a rancher’s wife without the slightest idea of what that meant, how to work with the sheep and tend to the land, was just one of many ways she’d showcased her youthful ignorance. It had been all about love, as defined by a woman too young to know how to recognize it. Pie in the sky, a twinkle in her eye and zero common sense. Whatever love was, that couldn’t have been it. Rowdy probably thanked the Lord every day that she hadn’t saddled him with her utter incompetence as a rancher and a life partner, not to mention her bad reputation across town. No. As bad as it had been, and still was, she had done him a favor, even if he now hated her for it. She’d cut those ties. Then her parents had virtually disowned her. Granny was all she had left after she’d left town, and for many years, she’d been too ashamed even to reach out to her. After she’d discovered she was pregnant with Toby, she had made her life right with Christ and she had reached out for Granny, who had welcomed her back with open arms and a loving and forgiving heart. But Angelica had never gotten back home to see her. Not in time. Granny had passed away before Toby was born. She hadn’t known that Toby would have special needs, be preciously different, and that God meant him for other things. That was one prayer that would never be answered. Not as Granny had wanted it to be, anyway. Angelica sighed. No matter how she looked at it, nor how much grief she felt at letting Granny Frances down, selling the ranch was the only conceivable answer to her dilemma—the only one that worked in the best interests of both Angelica and Toby. She was sorry not to be able to fulfill Granny’s wishes, but that was just how it had to be. She had to think of Toby first. She still had no idea why Jo had brought her here to the auction, when she should be at Granny’s ranch putting her affairs in order. As far as she was concerned, it was well past the time for her to leave the community green and the auction behind and return to Granny’s ranch house, where she could mull over her problems in private, release the thunder of emotions that had been hovering over her like a huge black storm cloud all morning. With her decision made, she turned away from the platform and started walking back toward the street where she’d parked her sedan, knowing Frank would give Jo a ride home. At the moment, the effervescent old redhead had her hands full with the auction—and, more specifically, with a rope full of Rowdy. Angelica skidded to a halt at Jo’s use of her middle name. The only other person in the world who had called her Angelica May had been Granny, God rest her soul. Tears sprang unbidden into Angelica’s eyes at the many happy memories that instantly flashed through her mind. Granny loved Serendipity get-togethers and would have been bidding up a storm on behalf of the senior center—probably snatching up one of the good-looking young bachelors from right under the nose of a pretty, single woman. And then, knowing Granny, she’d have him mucking stalls for her just so she could admire his muscular physique. Gramps had always been the only man for Granny and she’d never married again, but that hadn’t meant she couldn’t enjoy what the good Lord put in front of her eyes. She was old, not blind, she used to say and then she and Jo Spencer would cackle over their shared joke. With the well of deep emotion fractured, grief rolled into anger and Angelica stiffened. The scene unfolding in front of her became increasingly obvious with every step Jo took. She was dragging Rowdy right to Angelica’s side. Angelica didn’t dash away, even if every nerve in her body was urging her to do so. Question after question pressed her down. Why was this happening? Jo had to know there was no possible way any variation of this scenario would turn out well. Angelica mumbled unintelligible words under her breath, quietly venting her frustration with the situation, but her throat closed around her air and it came out sounding like she was choking on carbonated soda. So much for remaining incognito. Now the whole town would know she was here. And she knew she wouldn’t be welcomed back with open arms. Especially not after what she’d done to Rowdy. Even as a teenager, Rowdy had been popular in town. And from what she’d seen today, with everyone cheering and all those young ladies bidding for some time with him, that hadn’t changed. Rowdy was one of Serendipity’s favorite sons. She hadn’t been well liked, nor had she been understood. No one in town other than Granny, Jo and Rowdy had ever given her a fair shot. Now everyone would think she’d captured Rowdy at auction in some underhanded fashion that was unfair to the rest of the crowd. And the fact that she’d shown up in town unmarried and with a baby? This was so not going to work out well for her. Oh, why had she ever come home to Serendipity at all? She turned in time to see Rowdy digging in his heels, his cowboy boots raising dust. His brow was deeply furrowed and his lips were set in a hard line. Yep. Not happy to see her. Jo, however, wasn’t taking Rowdy’s reluctance as an answer. The more he balked like a mule, the harder she pulled. She stopped in front of a gaping Angelica and dropped the rope into her hand, pressing a sealed envelope into her palm at the same time. “This particular letter is addressed to the both of you,” Jo informed them, pointing to Granny’s unmistakable script on the front of the envelope. Angelica folded it in two and shoved it into the back pocket of her jeans without another look. Her mind was turning so fast she was getting dizzy. She couldn’t get her head around what all this meant. Buying Rowdy at auction before the auction even started. Leaving a note for the two of them. What part did Granny have in all this? Was she the one who’d put out the funds to keep Rowdy off the auction docket? Had she been conspiring with Jo? It looked like it. But why? “I had Chance prepare a special meal for you two in the picnic basket in the far corner of the green by the southeast bench,” Jo instructed. Angelica nodded, but not because she’d needed the directions. She already knew where the picnic basket was. She’d been the one toting it, for crying out loud. Toby’s baby carrier had been left near the basket, as well, and her sedan was parked on the street just beyond the bench. She should have realized something was off when Jo didn’t insist on taking her basket right into the center of the chaos. Jo wasn’t the type to live any part of her life on the outskirts. She wanted to dive in and be smack in the middle of everything. Then she turned and headed back to the podium without one more word of explanation. Surely Jo should know Rowdy and Ange were far beyond mending fences. Rowdy growled and yanked at the lasso, pulling it from Ange’s hand. He realized only afterward that he’d probably left a rope burn on her palm as he struggled free of the noose, but if Ange noticed she didn’t complain or alert him to the fact. It irked him that he felt a moment of remorse for giving her a second’s pain. Not when she’d given him a lifetime’s worth. He stood up to his full six-foot height and straightened his shoulders. He wasn’t the tallest man at the auction, but at her five-foot-four-inch frame, he had plenty of height to glower down at her. His chest burned with fire but his heart incongruously froze solid as anger sluiced through him like an ice storm in Antarctica. Ange pushed her hoodie back and whipped off her ball cap, shaking her long blond hair out of their confines. Tilting her chin up, she met his gaze head-on. It wasn’t the expression of someone who was sorry for what she’d done. She still maintained the same solitary determination as ever, ready to run roughshod over anyone who stood in her way. He wouldn’t be a sucker twice. She opened her mouth to speak, but he dug in before she could say a word. “Ange,” he ground out, his low voice sounding like sandpaper as he leaned back and crossed his arms over his chest, steel walls clamping down around his emotions. No way was he letting her in this time. “Rowdy,” she said, testing his name. She held out a hand to touch his arm but he grunted and twisted away. But not before he realized she had a baby in her arms. His frown deepened at the sound of his name on her lips. It had been such a long time. Her voice was so familiar…and yet then again not so much. He lifted the lasso and shook it under her nose. Rowdy’s eyes briefly settled on the tightly swaddled infant in Ange’s arms and then he flicked his gaze to her unadorned left hand. He was reeling with shock to see Ange suddenly back in Serendipity after all this time, especially with a baby in her arms. She hadn’t come home once since the day she’d left him alone and brokenhearted at the altar. She hadn’t even bothered to attend her own grandmother’s funeral. And yet now, for no reason Rowdy could guess, she was here, standing in the middle of the community green with a town function going on around her. And for some inexplicable reason, she’d somehow finagled things with Jo so she could buy him at auction before the event had even started. And the craziest thing of all was that she looked nearly as startled about this whole situation as he felt. As if she didn’t know any more than he did about what was happening. Which couldn’t be true, since she’d set it all in motion in the first place. It only remained to be seen as to why. What motive could Ange possibly have to want to see him again? He gritted his teeth to keep from snapping back at her. He could still turn and walk away, and not one person in town would blame him. She’d come home for a reason, and it couldn’t be anything good. If it was only about selling Granny’s ranch to him, well, he and Ange didn’t have to talk face-to-face for that. Their realtors could handle all the details regarding the transaction and all he would have to do would be sign the papers and fork over the funds to make it a done deal. Or was it more complicated than that? Was Jo somehow involved? Jo had purposefully forced their sure-to-be-stormytorrential reunion into pretty much the most public arena possible, leaving Ange and Rowdy no choice but to speak to one another with practically everyone in Serendipity looking on. And then there was the mysterious letter Jo had given Ange—the one she’d immediately shoved into the back pocket of her jeans. Maybe Jo thought Rowdy and Ange ought to bury the hatchet, so to speak, although maybe that wasn’t the best metaphor to use in this particular situation. As if he’d listen to anything Ange had to say. She’d ripped his heart to shreds. A reconciliation between the two of them was never going to happen. Not a relationship. Not a friendship. Nor even acquaintances, as far as he was concerned. He didn’t think he’d ever be able to completely forgive Ange for what she’d done, but he had put it all behind him. He’d made his peace and had moved on with his life. Why dredge it up now? To be completely honest, Rowdy hadn’t been sure how he would feel if he ever saw Ange again—or if he’d feel anything at all. And he didn’t like it. As his past rose to meet him, anger and indignation waged war in his chest, like dueling pitchforks, parrying back and forth, jabbing sharp points into his heart. Then he took a breath and the stabbing pains morphed into an ache so deep it left a gaping hole in its wake. How could merely seeing Ange again so easily stoke to flame all the emotions he’d thought he’d tucked away long ago? He was an even-keeled man. Not much threw him off-balance one way or the other. Except for one thing—one person. Ange had the singular ability to knock him off-kilter. She’d always been able to do that. In the past, he’d thought that was a good thing. He remembered his helplessness and hopelessness when he watched her ride off on her horse after their wedding rehearsal—one of the matched set of horses meant for them to depart on after their wedding—leaving him quite literally in the dust. She hadn’t even had the courtesy to look back and wave goodbye. And now she’d suddenly returned…why? Rowdy was desperately attempting to corral the emotions stampeding through him like a herd of wild buffalo with a pack of wolves on their heels. It took all his effort to keep his voice low so he wouldn’t startle the baby. “What’s the deal here, Ange? Why did you buy me at auction?” he whispered, his voice low and raspy. Her blue eyes widened, her expression sincerely stunned. As if she had the right to be. She nodded toward the crowd. True, many had turned back to watch the next bachelor take the stage—the twentysomethings who didn’t remember the night Ange had single-handedly ended her tumultuous relationship with Rowdy. But there were a few furtive glances and murmurs aimed their direction. Rowdy shrugged. He wasn’t the one who needed to feel uncomfortable. He hadn’t done anything wrong. If some of the older townsfolk had long memories, that wasn’t on him. Still, he nodded in agreement and followed her to a bench well out of the main stream of the celebration, where a festive picnic basket bedecked with baby-blue pastel ribbons was waiting for hungry picnickers—which Rowdy wasn’t. His gut felt like lead. An infant car seat and a yellow-giraffe-themed diaper bag covered the rest of the bench, marking it out for Jo and Ange’s use. Ange picked up the car seat and set it aside on the ground next to the bench, and then did the same thing for the diaper bag, gesturing for him to sit in the space she’d opened. She remained standing, shifting from foot to foot in a slow, rhythmic rocking motion as she pressed a kiss to the forehead of the infant she was holding in her arms. He wasn’t sure he believed her, no matter how adamant her refusal. And though he didn’t like it, the way she’d worded her statement about not wanting to buy him stung his ego. Pain flashed across her gaze and she shifted her eyes away from him. “I couldn’t come,” she murmured. He waited for more of an explanation, but none appeared to be forthcoming. “Can you hold the baby for a minute while I set things up?” she asked, pressing the infant into the crook of his arm before waiting for his answer. “Uh. Yeah. Sure,” he said, seconds after the fact. He shifted uncomfortably. He didn’t know how to hold a baby—at least a human infant—and he felt like an awkward giant made of all thumbs. His gut churned. He was used to bottle feeding little lambs, and this tiny bundle of humanity lying in the crook of his arm was a whole other thing entirely. Rowdy pushed the pastel green receiving blanket off the baby’s forehead so he could see his face better, and a jolt of realization slashed through him. Rowdy’s throat tightened. He was even less familiar with Down syndrome than he was with babies in general, but while this little guy was alert he wasn’t fussy, and after a moment, Rowdy’s heart calmed. “He’s beautiful,” he said, and meant it. Rowdy brushed a finger over Toby’s silky white-blond hair, a shade lighter than his mother’s. His almond-shaped blue eyes had popped open at the sound of Rowdy’s deep voice and were now staring up at him with interest. The little guy’s mouth was nearly wide enough to fit his entire tiny fist, and he was loudly sucking on his knuckles. Ange’s eyes widened at Rowdy’s compliment, as if she didn’t hear kind remarks very often. And maybe she didn’t. People were strange when it came to anything or anyone different than they were. Special needs freaked some people out, but it didn’t bother Rowdy. As far as he was concerned, all humans carried the same dignity because they were made in the image of God. Different was beautiful. She smiled sincerely, apparently satisfied that he meant what he said. Rowdy always meant what he said. As little as Rowdy knew about babies, his being a perennial bachelor, he knew enough to realize infants were a challenge for any new mama or daddy, even the experienced ones. He’d watched all of his friends get married and have babies, and seen their slow adjustments to the learning curve called parenting. Rowdy’s closest friend Danny Lockhart complained nonstop about having to stay up all night with a fussy infant who had her days and nights mixed up—and then in the next breath he’d proudly show her off, forgetting whatever trials he faced at two o’clock in the morning. So it seemed strange to Rowdy that Ange would choose to return to Serendipity where she had no real support as a single mother. Her parents had moved away long ago, not that they were ever terribly supportive of her. And he doubted, given the past, that Ange had many friends here, either, as horrible as that was to think. Was Toby’s father in the picture? If so, where was he? Holding down the fort in Denver while Ange visited Serendipity? She didn’t have a ring on her finger. Rowdy didn’t have much use for men who didn’t marry the woman they intended to start a family with. But that was a discussion for another time. Rowdy had so many questions he didn’t even know where to begin. As Ange prepared the picnic lunch, Rowdy studied her face. The telltale dark circles under her eyes and the lines of stress creasing her brow suggested her life hadn’t been easy on her. She looked older than her twenty-nine years, but she was nonetheless beautiful enough to make Rowdy’s stomach flip as he attempted to rein in the physical attraction he’d always felt toward her. That much, at least, hadn’t changed. He’d always seen the inherent beauty in her that she didn’t see when she looked in the mirror. But it was the only thing that hadn’t changed. And he had no idea what she saw when she looked in the mirror these days. “How’s Toby doing?” she asked as she popped the top on a can of Rowdy’s favorite soda. Ange handed Rowdy the soda and took Toby into her arms, landing a soft kiss on his cheek before gently placing him in his car seat so she and Rowdy would have their hands free to eat. “Still your favorite?” she asked, gesturing toward his soda can. And he really, really wished he didn’t. Because with every unexpected glimpse into their past, every unanticipated memory, it became harder and harder to catch a breath. He hadn’t been ready to see Ange again. And he wasn’t sure he ever would be. 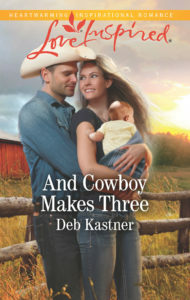 And Cowboy Makes Three will be available on May 21st online or at a store near you. And on a personal note, on May 7th at 4:30pm I lost my dear fur baby Missy. She was fifteen years old and suffered a sudden stroke that left her paralyzed. I am still grieving heavily. RIP Missy. Run free and play without pain over the Rainbow Bridge. Hi Deb, I’m sorry to hear about Missy. I am glad you have many memories of her. Thanks for sharing about your new book- the name Rowdy is a new one to me, makes me think of restless/naughty kids!! so I’m intrigued as to what his character will be like. What an awesome premise for a story, Deb… I can’t wait to read it! And I’m so sorry about Missy. These sweet creatures become part of our lives and families and it is terribly hard to lose them. Sending hugs… I hope Missy and my Porter are playing together in the Happy Hunting Ground. The book sounds like a fun read. Sorry about your dog. Blessings on your day. Wonderful excerpt. Sorry for your loss of your beloved pet after so many years. Thanks for the post. I am so sorry about your loss, they really do become family members! This looks like a fun book! Sorry about your dog We lost our border collie about 2 months ago so hopefully he is running with Missy! Love your book cover! I am so sorry about your fur baby. I grieve with you. I’ve been there too. I know I have abevy of fur babies waiting for me over the rainbow bridge too. I am so very sorry for the loss of your beloved pet. Love this premise since it is a vivid render we all need grace. Christian romance, really is my favorite thing! The fact that she was really going to sell her land to the man she left at the altar really gets me though… XD.